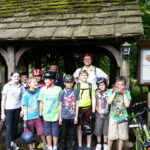 A group of nine Scouts cycled all the way from Groombridge to Worth and back on Saturday. It was with some trepidation we set out in the minibus and horse box in steady rain with a grim weather forecast ahead of us for our cycle trip. 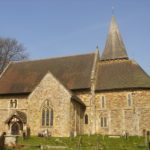 However, the weather gods must have been looking out for us because as soon as we pulled into the car park in Groombridge it stopped and we had beautiful sunshine all day. 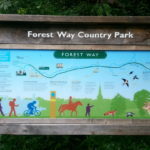 The trip was very straightforward; We followed the Forest Way from Groombridge to East Grinstead and then the Worth Way all the way over the M23 to the village or Worth. The only tricky bit was negotiating the traffic and pedestrians in East Grinstead town centre. After a break at St Nicholas’ church in Worth, we pedalled back for an ice cream, returning to the scout hut for dinner (thanks Jo). We rounded the evening off with a campfire / marshmallows and popcorn (never made popcorn over a camp fire before!) and then slept under the stars. It was the last thing we had expected given the damp start to the day. Somehow we managed to miss Stefan, Andy and Paul from all the photos – sorry! Distance: 51.8 km 32.2 miles, although the cycle computer said 34 miles! 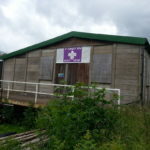 Previous PostScouts Complete Night HikeNext PostSunday’s Volunteer Day a success!